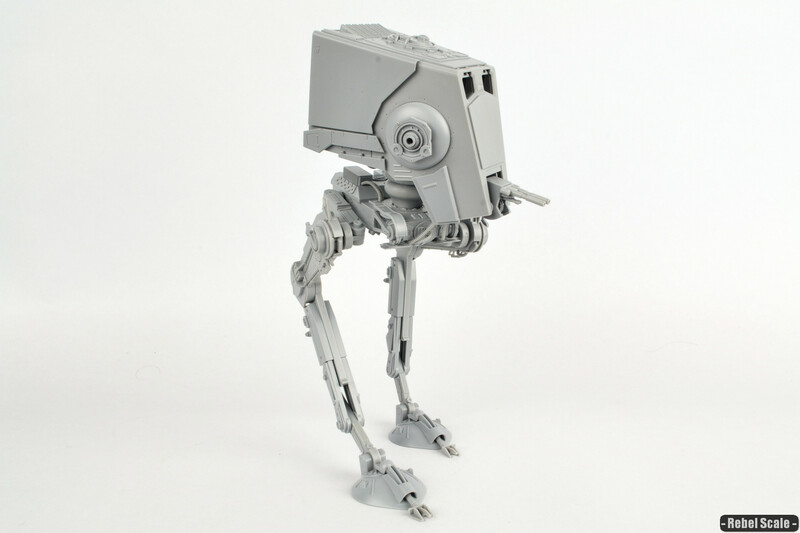 While I already did a build log for Bandai's AT-ST, I wanted to cover the leg articulation in detail. 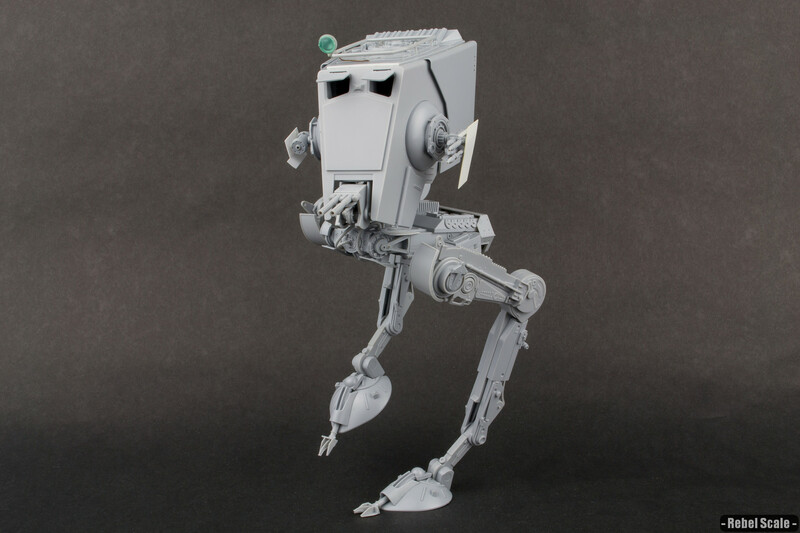 Moreover, I left out the the rotating effect of the inner hip and foot joints seen in RotJ and Rogue One. This is something that Jaitea pointed out in his build, but the pics are now lost in Photobucket hell. You can see the rotation in the photo with modeler Phil Tibbett. 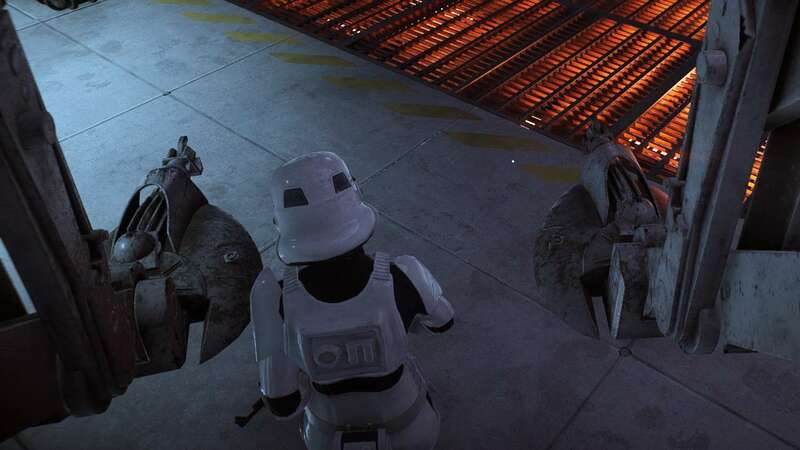 However, I believe the smaller models were the only ones to have the rotation. For me, adding these details creates a more impressive "bird-like" stance. 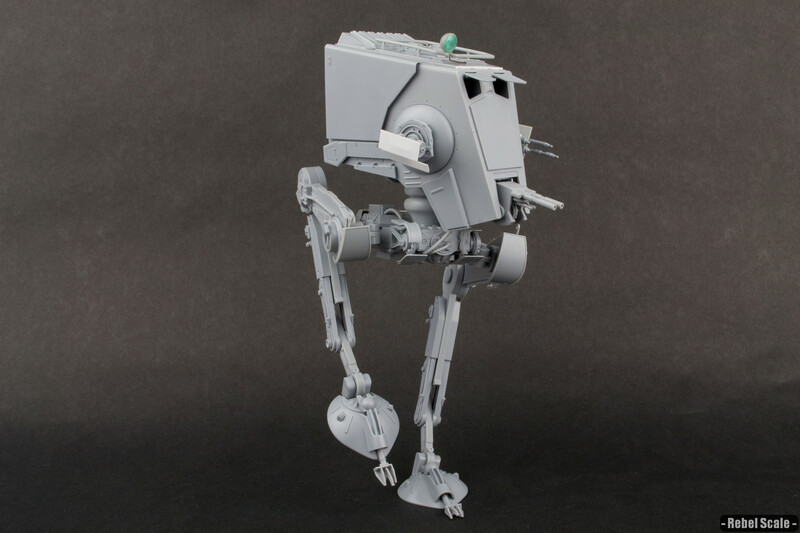 It also makes dioramas much easier and more interesting because you can pose your walker on slope or uneven terrain. Of course, none of this is necessary, but it's cool nonetheless. And best of all, it's not that hard to do. 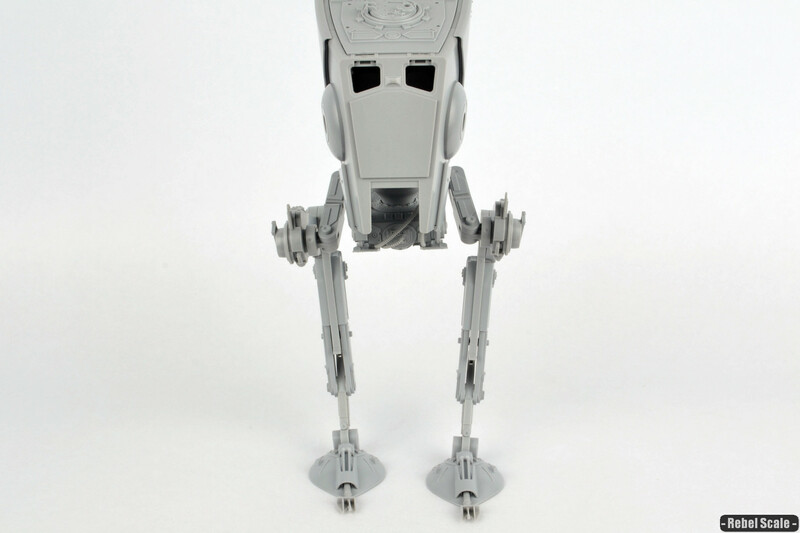 I'm starting off with the same leg modifications I made to my first AT-ST. For this step, I'm only modifying kit parts. 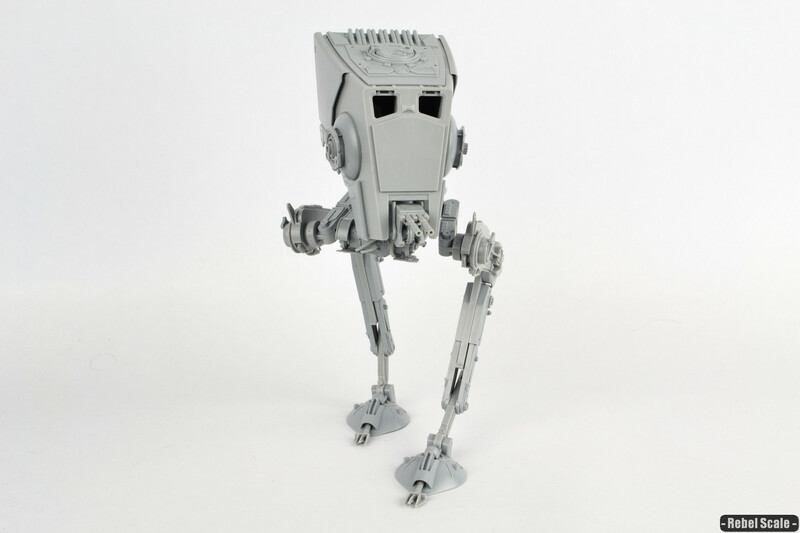 Now, I had stability issues from articulating the upper ankle joint (where the tension bar connects). So, if you remove the bits marked with a (! 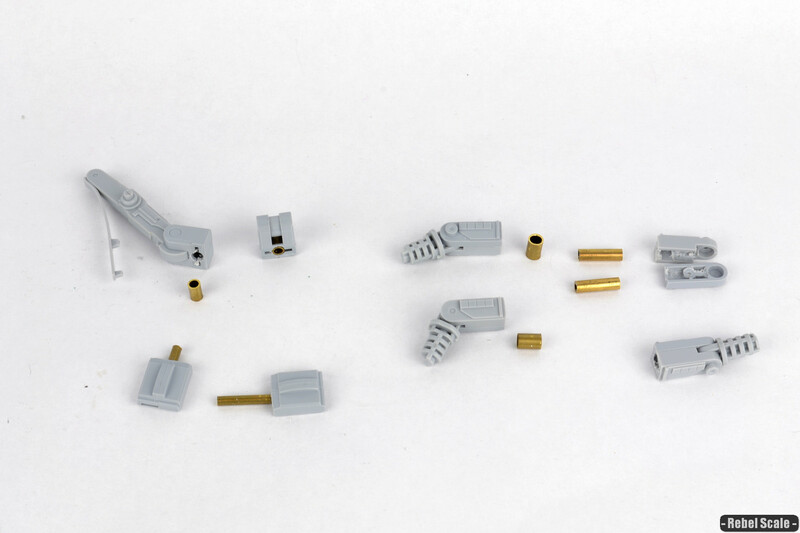 ), you will probably have to glue the foot in place once you have the position you want. 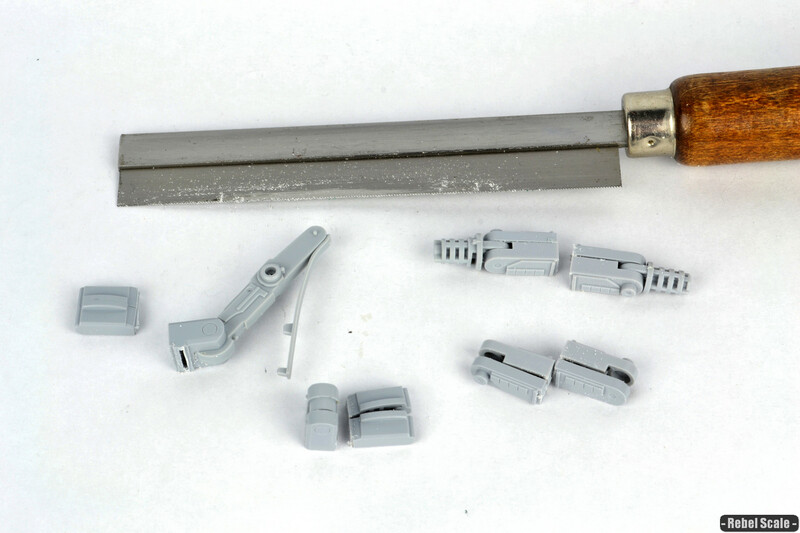 These are the parts I will be modifying. You are looking at the inner hip joints and the foot joints. 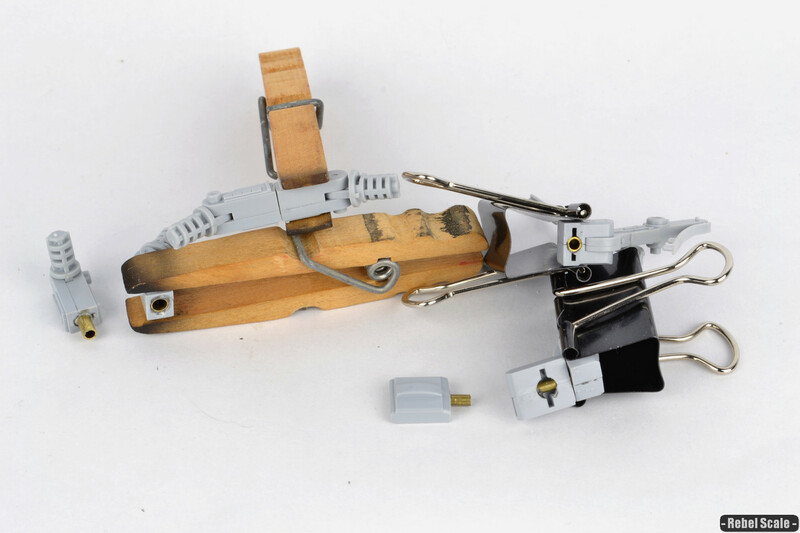 Since you will be gluing the foot parts together, you have to assemble the full lower leg piece with the tension strip in place beforehand. Don't forget to remove the tabs as in the previous step. Using a fine Zona saw, I was able to cut through the pieces rather neatly. 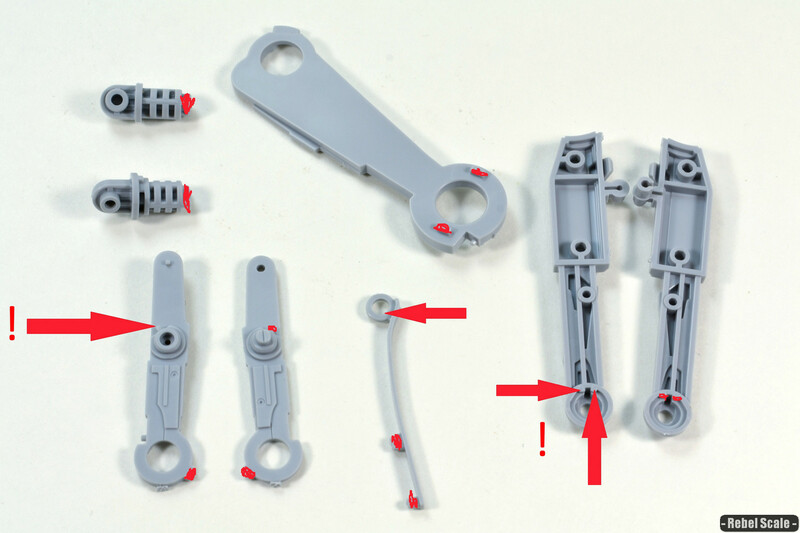 Because there's already a panel line on the inner hip joints, they were easy to cut. For the foot joints, I just lined up the saw with the 90 degree corner angle. Afterward, I filed away any excess plastic to make the parts fit flush. I used brass tubes to create the rotating joints. Using 3/32, 1/8, and 3/8 tubes, I drilled out holes in the parts to fit the tubes. Each of the brass tubes slide neatly into each other (KS brand). Ergo, the rotation should be smooth. If the tubes are too loose, I can add a little solder to the brass to increase resistance. 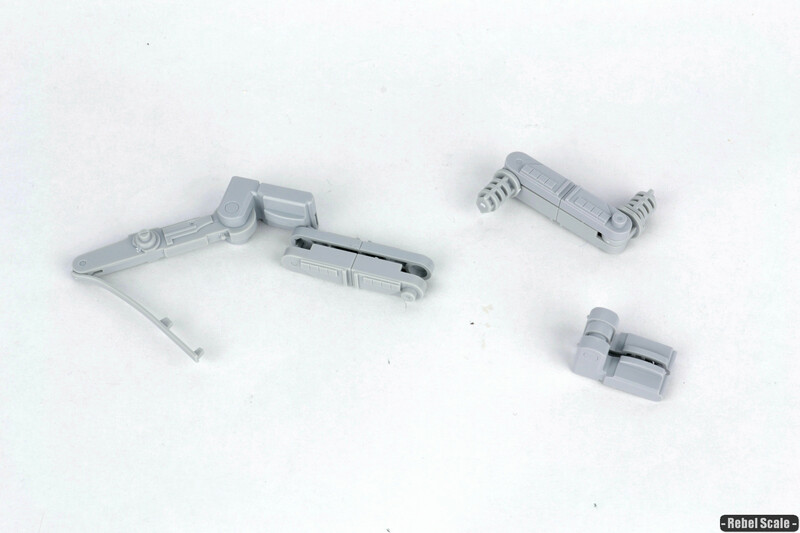 The feet will use 3mm of 3/32 tubing sliding into 5.5mm of 1/8 tubing. The hip joint will use 12mm of 1/8 tubing sliding into 6mm of 3/8 tubing. 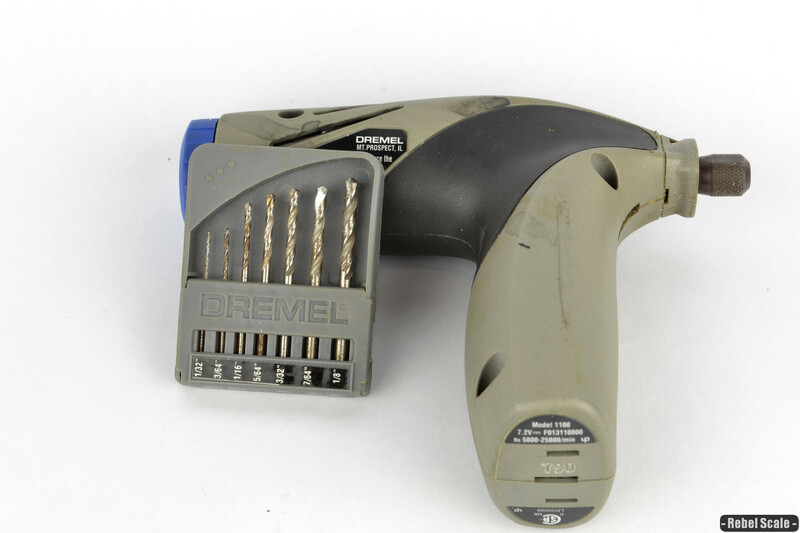 For drilling the parts, I highly recommend a Dremel on low-power. Usually, I would use a pin vise, but the holes are along the seamlines of the parts. If you use a pin vise, you will most likely force the two halves apart rather than drilling a hole. Also, I highly recommend starting with a small drill bit and slowly increasing bit sizes until the tubes fit. You don't want to oversize the fittings. Yes, even I make mistakes...a lot of mistakes. So, I thought I'd showcase one. I accidentally drilled too far into one side and hit the rotating joint part. It didn't cut out too much, but I did have to fill it in with some Apoxie Sculpt. Now, the putty wouldn't help much if the part was cracked. But for this little mishap, it worked perfectly. At this step, I began gluing the brass rod to the parts. I started with the longer tubes, which will help me later align the shorter tubes. 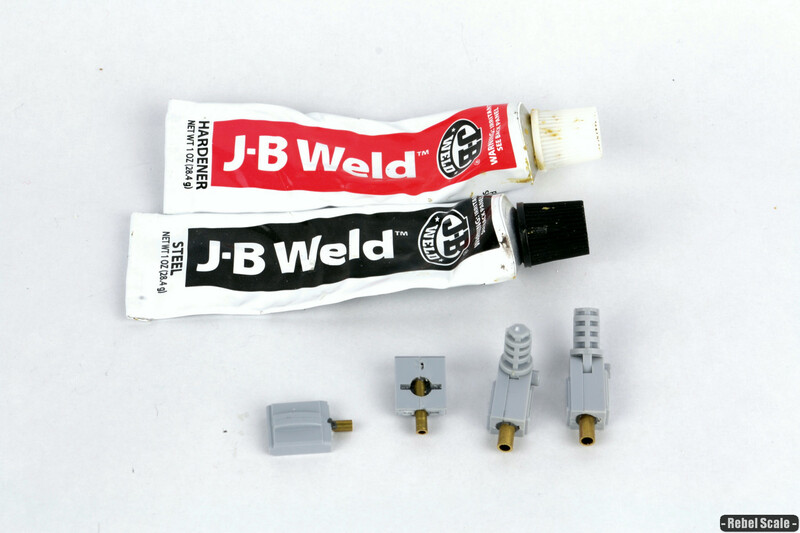 For attaching brass to plastic, I have found that JB Weld works best. It allows plenty of time to align parts, and becomes very hard, but not brittle. Also, I would suggest putting the pieces in a safe place, as the JB weld will be pliable for several hours. For the brass tubes that will be flush with the plastic joints, I dry-fit everything to make sure it aligned. 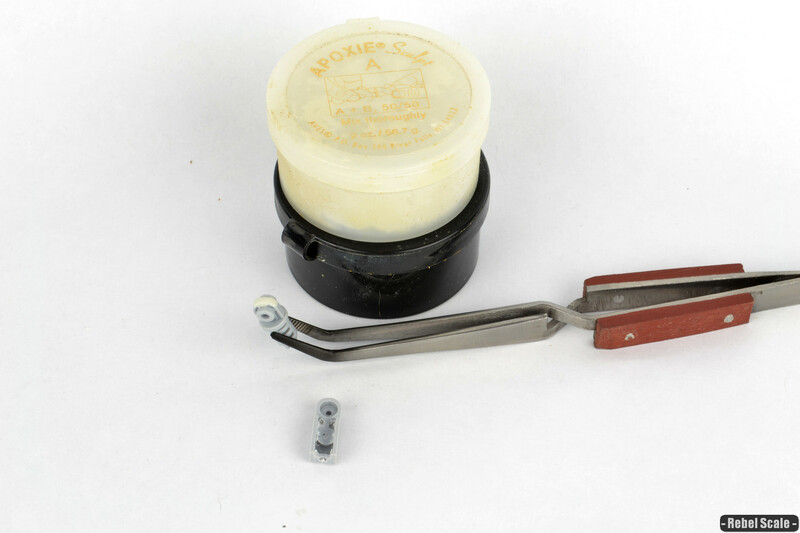 It's helpful to attach the parts from the previous step to the shorter brass tubes. Then, I placed the tubes in the joints and made sure everything lined up. Once I was ready, I added the glue. 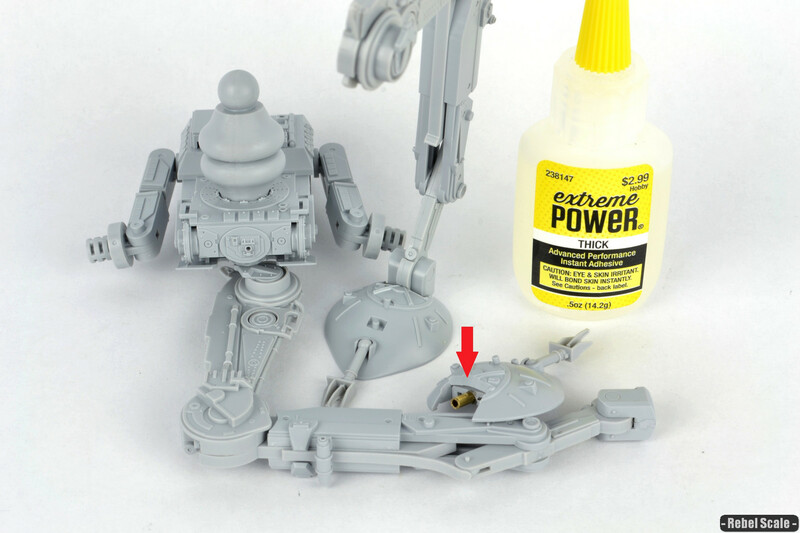 Remember that you have to add the lower leg to the foot pieces before you glue them. 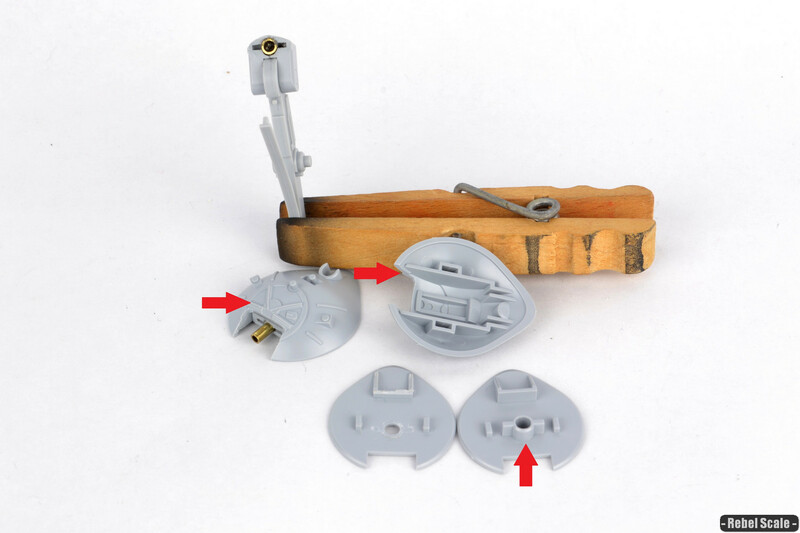 However, be sure not to get any glue on that piece or the foot will not be able to move up and down. 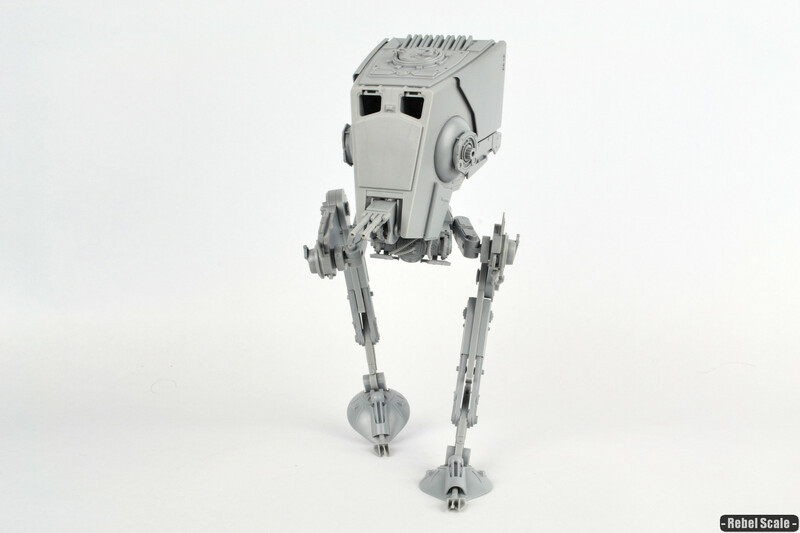 Now, I had to make some small modifications to the feet to allow the joints to rotate. Firstly, I sliced off the little lips of plastic on the underside of the foot shown next to the middle arrow (not yet removed). Next, I cut off the mounting hole in the lower foot pad (lower arrow). I also shaved off a small line on top of the upper foot pad that was hitting the leg joint (left arrow, not yet removed). The last challenge is to sand and round off the rotating joint (top center). It's important not to sand off too much as you will hit the open gap in the parts. So, one of the problems I immediately noticed was how loose the brass tubes were when fitted. After all, they are smooth metal. So, one trick I learned is to apply a little thick CA superglue to the smaller tube, attach it, and rotate it until the glue sets (which is pretty quick). By rotating it, the glue won't bond the tubes but fill the gap, thus creating more resistance in the joint. 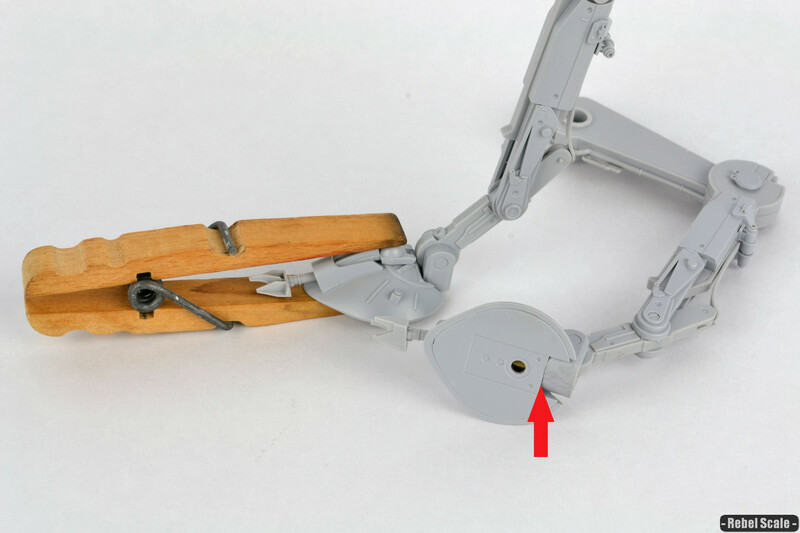 Also, I had to remove more styrene from the upper foot (red arrow) to allow full rotation. Well, I had a few minor issues gluing the bottoms of the feet. I had to sand down the inner parts a little, so that the feet would fit flush. Also, I found that the back edge of the feet bottoms was hitting the new rotating ankle. 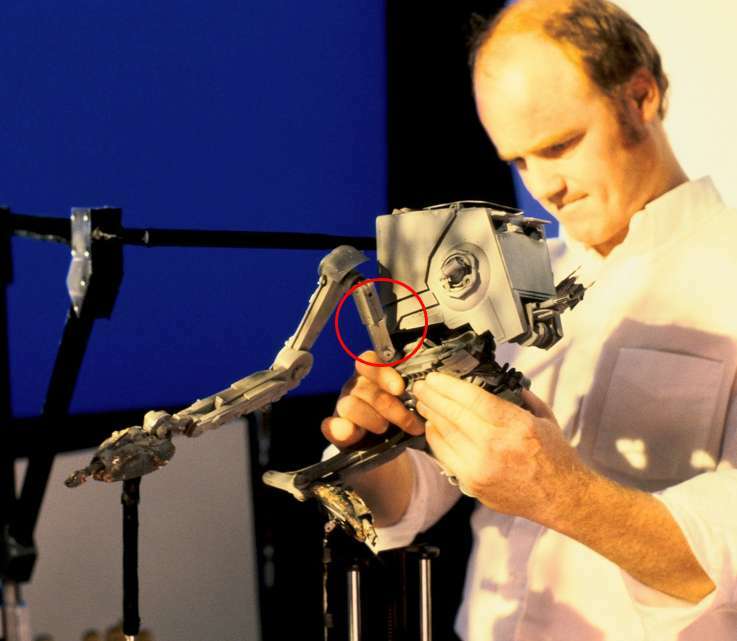 So to fix that, I just shaved about a millimeter off the back edge (red arrow). Finally, I clamped the feet together before using a quick-setting cement to glue them. And now here we are: full-poseability, solid, sturdy, no plastic scraping plastic, and it's accurate to the movies. Yes, it takes a bit of work, as well as a little extra finesse to get the pose just right, but I think it's worth it. Here's a shot of it walking. Most of the weight is on the left foot (right side of pic). And here's another walking shot. Again, most of the weight is on the left foot with the right foot barely touching the ground for a bit of balance. Also, notice how you can angle the lower hull. Yet another shot showing how wide of a stance you can create. The trick is finding the right "sweet spot" for the hull balancing over the legs. And yes, with the right angles, you can get it to balance on 1 foot. The foot needs to be right under the head. Here's another shot using the same angles. Again, the foot is balanced under the head, and the lower hull is slightly angled as well.